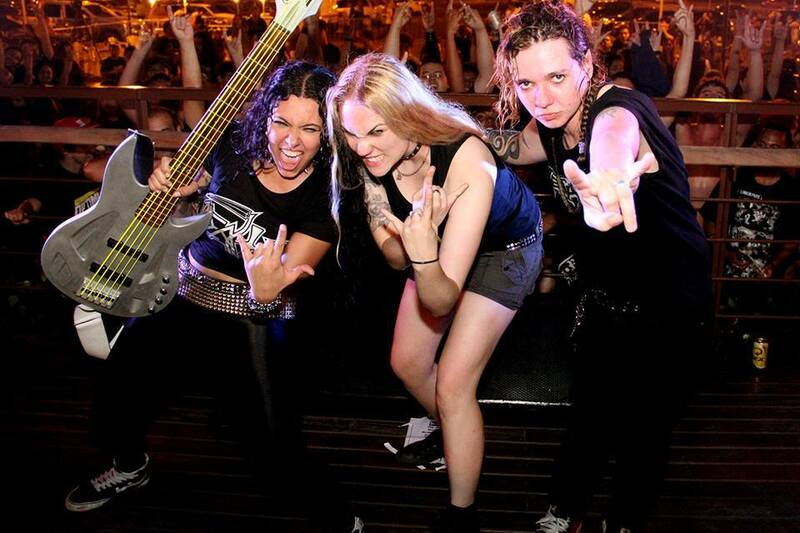 Nervosa now is probably more popular than they ever been before. 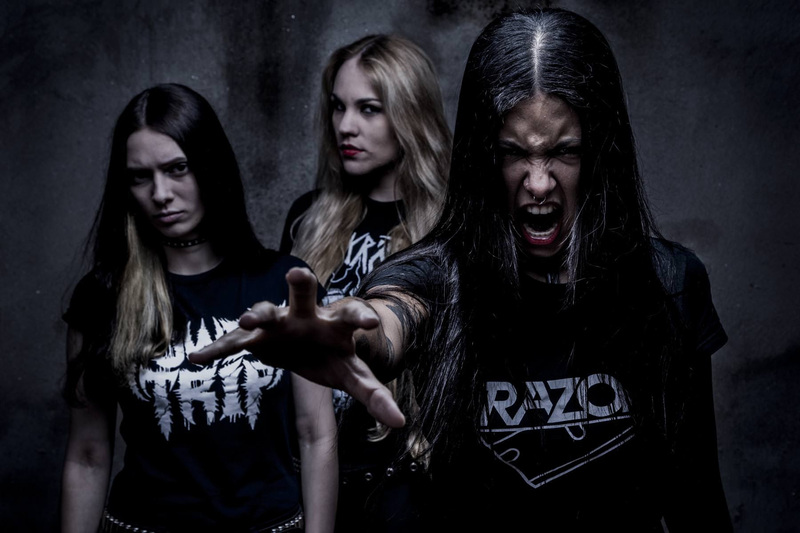 Nervosa are to the 2010s what Sepultura were to the 1980s and 90s. Brazil’s biggest and most popular mainstream metal export. It would be folly to expect them to do things differently on their third album. “Downfall Of Mankind”, like “Agony” before it, is straightforward, high-octane thrash metal with little in the way of nuance or even variation. Three albums in and Nervosa still shows no signs of evolving beyond the basics that “Victim Of Yourself” laid out four years prior. Those hoping for an evolutionary jump the same way their once-popular forebears experienced between “Morbid Visions” and “Schizophrenia” to finally arrive at “Arise” better look elsewhere. “Downfall Of Mankind” confirms every fear that “Agony” only alluded to. 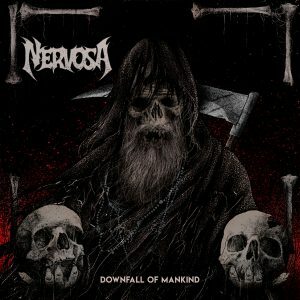 Nervosa is slowly but surely becoming a victim of its own rampant popularity and they show limited growth within the confines of their revivalist thrash sound. ‘Kill the Silence’, the lead single for this record, lays out pretty much everything you need to know about “Downfall Of Mankind”. While Fernanda Lira’s vocals are probably at their most raspingly evil, and her rumbling plucked bass guitar licks are funky as ever; Prika Amaral on the other hand has apparently reached her limits as a songwriter. “Downfall Of Mankind” is, in a trait that is either admirable or unfortunate, exactly the same record that “Agony” or “Victim Of Yourself” was. Nothing more, nothing less. 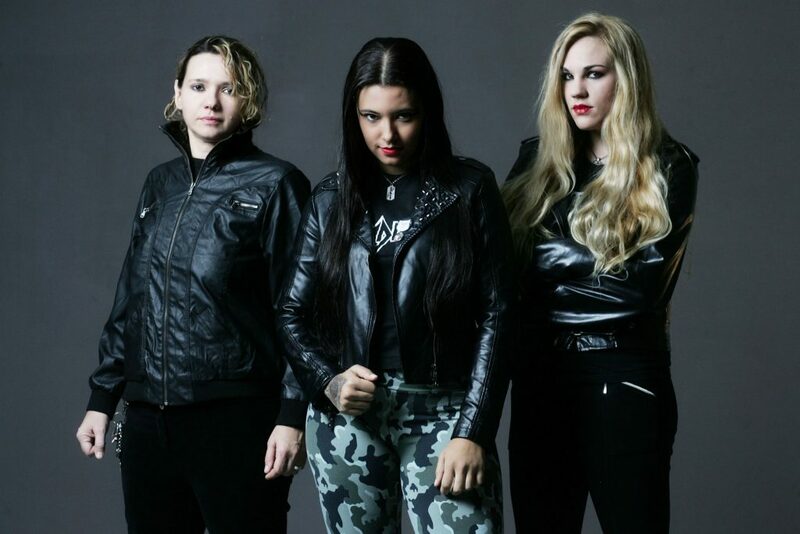 Not even Luana Dametto, one of Brazil’s most promising young drummers and the force behind death metal band Apophizys, is able to elevate Amaral’s songwriting to the next level. “Downfall Of Mankind” is, for the lack of a better term, reliable and efficient. Which doesn’t mean that it offers up a great deal of variety or replayability. In fact, it doesn’t. Which is sort of the problem. Dametto clearly is the most technically proficient skinswoman Nervosa has yet been able to rope in. Yet we can’t shake the impression that Luana would be better served in a band as, say, Malevolent Creation. What is also becoming increasingly evident is that Nervosa is in dire need of a second guitarist. Amaral currently performs both the rhythm - and lead sections leaving not a whole lot of room for her playing to evolve. Even that other popular Brazilian export Krisiun managed to overcome that particular shortcoming in the studio. As of now Nervosa is clearly stuck in a creative rut. An efficient, fun one – but a rut all the same. The ladies also seem under the mistaken impression that quantity equals quality. It does not. It never does. Outside of a completely superfluous and very unnecessary intro (aptly called ‘Intro’ to avoid all possible confusion), the regular edition of “Downfall Of Mankind” consists of 13 tracks, with the special editions adding ‘Selfish Battle’ as a bonus. Instead of picking the 9 or 10 of the best songs and releasing the remainder of the session as an EP, once again there’s an abundance of very similar sounding material present. ‘Never Forget, Never Repeat’ is probably the meanest Nervosa has sounded at this point and it allows Dametto to flex her muscles and show her stamina. “Downfall Of Mankind” possesses a greater vocal presence from Amaral and her deeper register vocals beautifully offset Lira’s serpentine rasps. ‘…And Justice For Whom?’ and ‘No Mercy’ are the closest the trio has ever come to classic Slayer territory. ‘Kill the Silence’ was chosen as lead single for a reason and it perfectly summarizes the record. More than ever before does Lira’s bass playing mirror that of Cannibal Corpse’s own Alex Webster in tone and delivery. Amaral’s leads are probably at their most scorching on this record, but none of them tend to be very memorable despite their explosive brevity and fieriness. "Downfall Of Mankind" remains criminally underdeveloped in its ideas and while intense in a very straightforward and superficial manner, it doesn't possess an inch of the innate musicality and muscle of Metallica's youthful "Kill Em All". Expecting a band to show growth eight years after forming isn’t too much to ask, is it? The Hugo Silva artwork is emblemic of Nervosa as a band. At this point in time you’d reasonably expect them to finally sport that long pined after Ed Repka, Dan Seagrave, or Eliran Kantor canvas. There’s certainly nothing to complain about on the production end of things. Lira's bass tone sounds nearly identical to that of Webster on Cannibal Corpse's "The Bleeding". The quandary lies in the fact that “Downfall Of Mankind” simultaneously meets expectations as well as falling short of them for the exact same reasons. 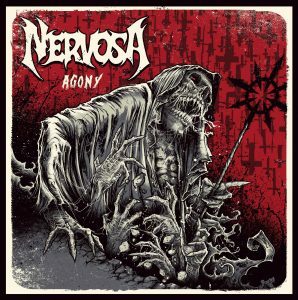 Nervosa is a painfully, frustratingly limited band as far as their songwriting is concerned. Even with Dametto behind the kit the average tempo does not change. There are no sudden bursts of speed, neither are there any great diversions into more compositionally dense or more structured material. No. Nervosa plows forward in a pretty straightforward manner with simply structured songs that never build on any of the ideas they have. Those hoping to hear them write their own ‘Welcome Home (Sanitarium)’, ‘At Dawn They Sleep’, or ‘Dead Embryonic Cells’ will be left sorely disappointed indeed. Nervosa in 2018 is identical to that of 2010. It almost makes you question whether these ladies are truly worth all the accolades they have been getting these past eight years. That “Downfall Of Mankind” is everything you’d expect it to be is admirable in a way. Nervosa has proven to be very reliable in what they do, but their assault is starting to wear thin. Nervosa has yet to show any kind of compositional growth. “Downfall Of Mankind” sounds just like “Agony” two years before and that sounded just like “Victim Of Yourself”, itself but a mere extention of their “2012” demo (later re-released as “Time Of Death” upon signing to Napalm Records). How we’d love Nervosa to up the ante and go that extra mile to add a layer of sophistication to their compositions. There’s no contesting that Amaral, Lira and Dametto can play, the problem is that their songwriting tends to be one-dimensional and doesn’t offer up a great deal of variation. As with past records most songs tend to blur together with only few offering some respite, usually songs chosen as singles. “Downfall Of Mankind” is no different in that regard. It’s more of the same and it lives entirely up to expectations if that’s what you expect and nothing more. Those hoping to get something more out of the record than a serviceable whipping of crunchily produced, energetic revivalist thrash metal will be left with their hunger. “Schizophrenia” or “Arise” this most certainly is not. And that’s a pity because these ladies certainly have the chops to write something far more engrossing. This is not that album, and that’s perfectly alright. In two years from now, maybe? We'll see.